It’s baaaack. 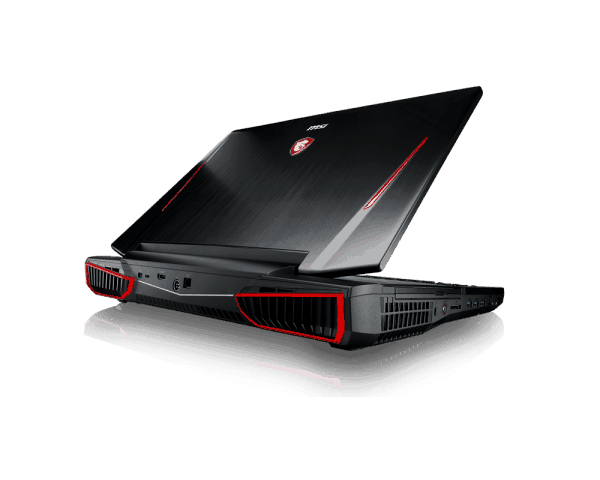 Just when you thought it was safe to whip out that namby-pamby gaming laptop, here comes the MSI GT83VR Titan SLI with a whole lot of awesome in its bag. For starters, it’s the world’s first gaming laptop to feature a keyboard with Cherry MX Speed Switches for faster fragging. The laptop is one of the first gaming rigs to ship with Intel’s 7th-generation Kaby Lake processor, and if that’s not enough power for you, this baby’s also packs dual Nvidia GeForce GTX 1080 GPUs in SLI configuration. In short, the Titan is ready and waiting to shred through your favorite games –if you can afford it. The Titan is just as big and beautiful as ever. Clad in brushed aluminum, the 13.1-pound, 16.9 x 12.4 x 1.7~2.5-inch rig cuts an imposing, desk-monopolizing figure. It’s heavier and thicker than the Origin Eon17-SLX 10 Series (12.8 pounds, 17 x 12 x 1.9 inches) and the 8.9-pound, 16.4 x 12.7 x 0.8~1.5-inch Asus ROG G752VS OC Edition. And it just makes the Razer Blade Pro (7.8 pounds, 16.7 x 11 x 0.88 inches) look like an ultraportable by comparison. Once you accept the Titan’s enormity, don’t be afraid to take some time to take in the inviting sheen of the notebook’s aluminum lid, which is accented with a pair of glowing red darts, a backlit dragon sigil and a gleaming chrome MSI label. The rear vents are trimmed in red aluminum and have an alluring glow. As with previous iterations of the Titan, opening the lid reveals a large mechanical keyboard and a digital touch/number pad occupying the space where you’d normally find a palm rest. That just leaves the large dragon-etched panel at the top. As cool as it looks, it’s not simply for show. DIY-ers can remove this piece to access the RAM and solid-state drives. Although the Titan is a gaming battlestation in its own right, you can always add a few more peripherals. The laptop is overflowing with ports and slots, starting on the right, which houses a pair of USB 3.0 connectors. Along the left, you’ll find three more USB 3.0 ports, as well as a 3-in-1 card reader, a Blu-ray burner, a digital audio port, jacks for a mic and headphones, a Hi-Fi audio jack and a security lock slot. There’s still more portage to be had along the back, which contains a Thunderbolt 3 port, a mini DisplayPort, an HDMI 1.4 port and an AC power jack. Well, this is new. MSI has swapped out the Titan’s Cherry MX brown switches on the mechanical keyboard for its Speed Silver switches, making it the first and only gaming laptop with the feature. Cherry claims these switches are shallower than others so that gamers don’t have to press down as hard to shoot or move. According to our tests, the Speed Silver Switches have 3.4 millimeters of travel, which is actually a little bit deeper than the 3.1 mm brown switches on last year’s model. However, the new keys require a much-lower 62 grams of force to actuate, versus the previous generation’s 71 grams. In practice, they feel much shallower. That translates to a typing experience in which the mechanical keys aren’t as snappy as ones with red or blue switches. However, they’re just as comfortable. My fingers danced across the keys at a rate of 72 words per minute on the 10FastFingers.com typing test, which is better than my usual 65 wpm. 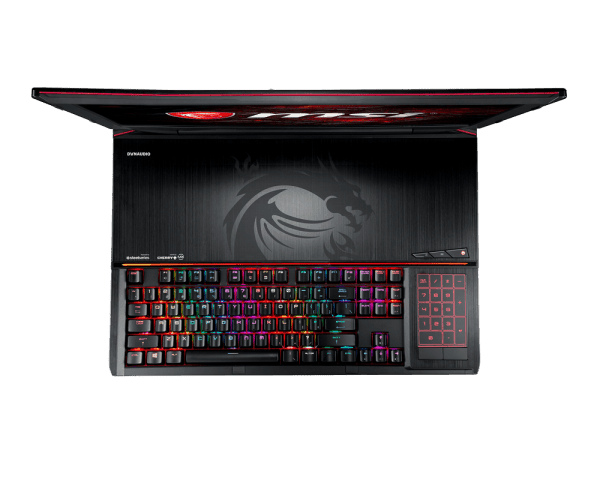 The other big keyboard change is that the Titan has finally ditched the all-red color scheme in favor of customizable RGB backlighting. Using the SteelSeries Engine software, you can choose from 18 different presets, including Disco Mode, American Flag, Warp Drive and Horizontal Wave. Or, you can create your own custom masterpiece. The software also gives you the ability to create map macros for specific keys. The laptop retains the funky 2.3 x 3.4-inch digital Synaptics touchpad from previous models. And as on its predecessors, the touchpad transforms into a number pad when you tap the Num button in the top-left corner. The setup works as a touchpad, allowing me to pinch-zoom and three-finger press or flick to my heart’s desire. The pair of discrete mouse buttons delivered firm, clicky feedback. One day, MSI will bestow upon the Titan the 4K Nvidia G-Sync panel it deserves. But alas, today is not that day. For now, we’re making do with a 18.4-inch, 1920 x 1080 IPS display, which serves up plenty of vivid hues and crisp detail. During the “Sleight” trailer, the text was so clear that I could easily read the name written on a 7-of-diamonds playing card in a window. The brown eyes of a girl looking at the card in amazement popped against her light-blue shirt and dark-blue apron. During Rise of the Tomb Raider, Lara’s arms and face were rife with bright-red scratches from a recent car crash. Dark-red blood soaked through a part of her gray shirt, turning it to a muddy brown. Lara’s chestnut hair gleamed under the bright-blue sky of the Syrian desert. The Titan’s eye-catching color is a result of its ability to reproduce 114 percent of the sRGB gamut. That’s enough to match the G752VS but not the 128 percent desktop-replacement average or the curve-breaking scores of the Eon17-SLX (178 percent) or the Blade Pro (185 percent). Although the Titan’s screen is definitely vivid, the hues aren’t as accurate as I would like. The panel produced a score of 2 on the Delta-E test (0 is ideal), which is noticeably worse than the 1.5 category average but slightly better than the Blade Pro’s 2.3. 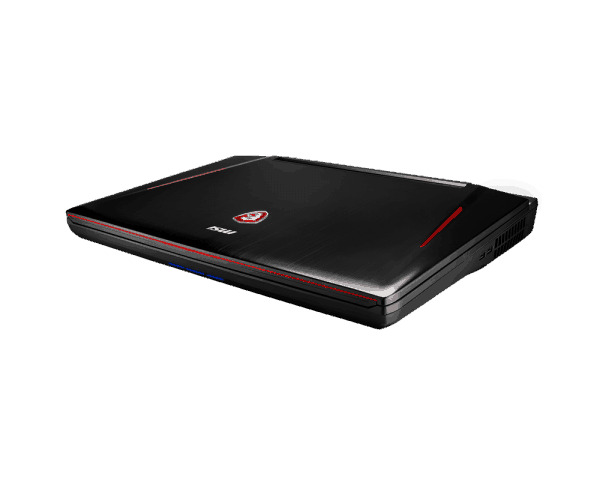 The Eon17-SLX and G752VS proved to be more accurate, with scores of 1 and 0.9, respectively. Another area the Titan could stand to improve on is brightness. The panel averaged 295 nits, which is just under the 296-nit average. The Blade Pro, the G752VS and the Eon17-SLX were relatively brighter, at 304, 326 and 335 nits, respectively. Booming bass and warm, clear mids and highs await from the Titan’s powerful Dynaudio speakers and bottom-mounted subwoofer. The system easily filled our test lab with the funky life lessons of Jamiroquai’s “Time Won’t Wait.” I enjoyed the crisp cymbals, deep lows and lilting vocals on this upbeat track, but I noticed that the mids were a tad harsh when all the elements of the song werer playing at max volume. I tried fixing it by using the included Nahimic 2 software, toggling through its many presets (Music, Comm, Movie, Shooter, Strategy, Role Play and Racing), to no avail. I ended up disabling the Boost, which delivered a more balanced auditory experience. The audio was spot-on when I started playing Rise of the Tomb Raider. Switching over to the Shooter preset, I enjoyed listening to the ragged winds of an incoming winter storm commingling with the swell of violin strings. When an ice cliff disintegrated under Lara’s ax, the falling debris was thunderous, but I could still hear the smaller ice shards shattering like glass. In addition to the myriad presets you’ll find in the Nahimic 2 software, you get a couple of game-enhancing features, such as SoundTracker. When this feature is enabled, the software works to pinpoint enemy locations based on sounds, so no one gets the drop on you. Streamers will appreciate Audio Launchpad, which maps sound effects to keyboard shortcuts. To keep up with the growing virtual-reality market, Nahimic has also added virtual 7.1 surround sound for a more immersive audio experience. I always subscribe to “the more, the merrier” line of thinking when it comes to graphics cards. Yes, it’s expensive, but good God, the power! The Titan harbors a pair of Nvidia GeForce GTX 1080 GPUs, each with 8GB of VRAM in SLI formation, which translates to some face-melting frame rates. Because these are 10 Series GPUs, it’s a given that the Titan is VR-ready. The notebook notched 11 on the SteamVR Performance test, placing it on a par with the Eon17-SLX, which is also smuggling a pair of GTX 1080s, and the Blade Pro, with its single 1080. The G752VS (Nvidia GeForce GTX 1070 GPU) was only a half point behind, at 10.5. That meant it was smooth sailing when I started playing Superhot on the Oculus Rift. The only thing I had to worry about was keeping the Touch controllers in my hand as I punched, dodged and shot my way past orange, polygonal people looking to send me to my maker. The Titan continued to flex its muscles on our traditional gaming tests. For instance, it delivered 121 frames per second on the Hitman benchmark (Very High, 1920 x 1080), dusting the 93-fps average. The Eon17-SLX and the Blade Pro were in a dead heat at 103 fps, while the G752VS hit 89 fps. During the Grand Theft Auto V test, the Titan produced an impressive 139 fps, surpassing the 95-fps average. The Eon17-SLX wasn’t too far behind with 121 fps, but the Blade Pro and G75VS were almost lapped, at 65 fps and 69 fps, respectively. Finally, a Kaby Lake processor in a gaming laptop! At long last, Intel has released these bad boys into the wild, and so far, I’m reasonably impressed. Intel claims that the new 7th-generation chips will yield noticeable performance boosts. The Titan’s 3.1-GHz Intel Core i7-7920HQ processor with a whopping 64GB of RAM easily streamed an episode of “Chewing Gum” on Netflix while running a system scan with 22 additional tabs open in Google Chrome. On the Geekbench 3 test, which measures overall performance, the Titan hit 15,908. True, it’s short of the 17,604 desktop-replacement average, but you have to take into consideration laptops such as the Eon17-SLX (4.5-GHz Intel Core i7-6700K CPU) and the G752VS (2.7-GHz Intel Core i7-6820HK CPU), both of which feature overclockable processors. I mean hell, the i7-6700K is a literal desktop chip. That explains the 17,639 from the Eon17-SLX as well as the G752VS’ mark of 15,563. Meanwhile, the Blade Pro’s 2.6-GHz Intel Core i7-6700HQ CPU obtained only 13,406. For such a massive system, the Titan is incredibly fast. The laptop’s pair of 512GB PCI-e SSDs in Super RAID 4 configuration (and a 1TB, 7,200-rpm hard drive) duplicated 4.97GB of multimedia files in 5 seconds. That’s a transfer rate of 1,017.9 megabytes per second, which absolutely roasts the 572.2-MBps average. The G752VS (256GB M.2 SSD) was a distant second, at 848.2 MBps. The Eon17-SLX (dual 256GB M.2 PCI-e SSDs) and Blade Pro (dual 256GB PCIe SSDs) achieved 424.1 MBps and 391.5 MBps, respectively. The Titan paired 20,000 names and addresses in 3 minutes and 9 seconds, matching the Eon17-SLX on the OpenOffice Spreadsheet Macro test and beating the 3:35 category average. The G752VS clocked in at 3:23, while the Blade Pro was the slowest, at 4:06. Dual-wielding GPUs requires a hell of a lot of power. So I wasn’t too surprised when the Titan bowed out of our battery test (continuous web surfing over Wi-Fi) at 2 hours and 18 minutes. It’s well below the desktop-replacement average of 4:21, but it’s still better than the Eon17-SLX’s time of 1:25. The Blade Pro lasted 2:45, while the G752VS plugged along for 3:42. For its giant size, the Titan remains cool and quiet under pressure, thanks to MSI’s Cooler Boost Titan system. 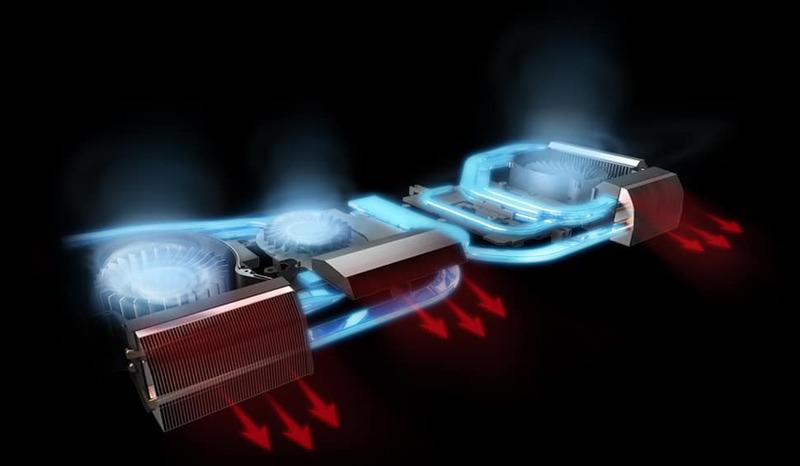 The company redesigned the fans and added a whopping 15 heat pipes to ensure that the CPU and GPU stay at optimal temperatures, whether you’re gaming or vegging out. I spent 15 minutes exploring dank lost caverns in Tomb Raider. When I was finished, the center of the keyboard and touchpad measured 82 degrees Fahrenheit. The laptop’s undercarriage hit 99 degrees, which is a few degrees above our 95-degree comfort threshold. Throughout my play-through, the fans were whisper quiet, allowing me to further immerse myself in the game. The Titan is even cooler when it’s not rendering graphics in gorgeous 1080p. After we streamed 15 minutes of a high-definition YouTube video, the touchpad and space between the G and H keys hit 76 degrees. The laptop’s bottom measured 85 degrees. The Titan’s 1920 x 1080 integrated webcam takes some of the best photos I’ve seen from a notebook. Test shots lacked the heavy grainess you’d normally see from a webcam. Instead, I could see just about every detail of the black stitching on my orange dress. However, the color was far from exact, as my skin tone and my bright-orange dress looked muted. My hair also took on a brownish hue instead of purple. 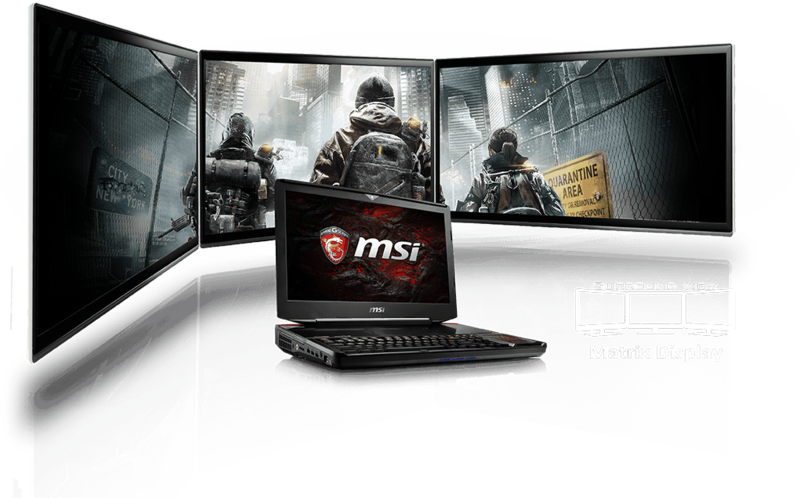 MSI’s usual cast of gamer-centric software is all present and accounted for. MSI has given the Dragon Center app a makeover, creating an easy-to-access hub that places useful apps such as SteelSeries Engine, Nvidia GeForce Experience, MSI True Color and Killer Network Manager under tabs. The System Monitor tab allows you to check your system’s status, while the LED Wizard helps you to create custom indicator lighting. System Tuner allows you to create profiles that control VR optimization, display color temperature and more. Finally, there’s Tools & Help, where you’ll find software for Burn Recovery and Battery Calibration. The Titan harbors a pair of Nvidia GeForce GTX 1080 GPUs, each with 8GB of VRAM, in SLI formation, which translates to face-melting frame rates. Third-party apps geared toward gaming include Nvidia’s GeForce Experience, which offers a solid suite of apps to optimize settings or live stream your gameplay. If you’re not a fan of Nvidia’s streaming capabilities, you can always check out XSplit Gamecaster, which is also included. Killer Network Manager is also on board to ensure any available bandwidth is going toward your games. Other third-party apps include Twitter, Candy Crush Soda Saga, Drawboard PDF, Royal Revolt 2, Music Maker Jam, Magix Music Maker Silver and Magix Photo Manager 16. 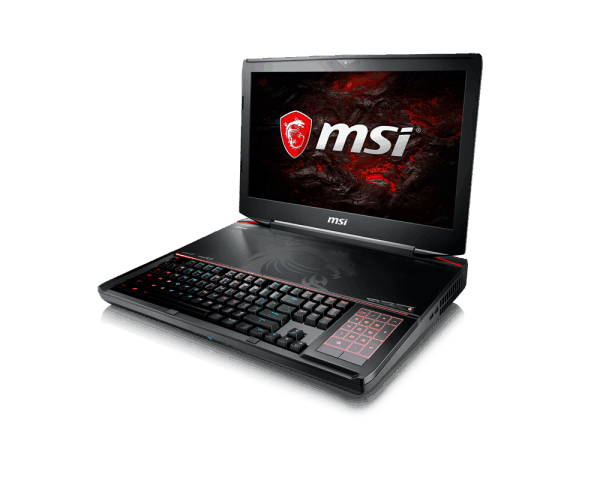 The MSI GT83VR Titan SLI includes a one-year limited warranty. The Titan’s $5,099 price tag could pay about four months of my rent. 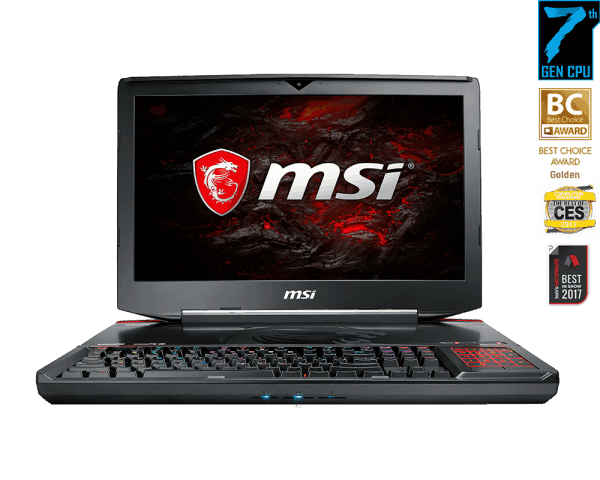 For that price, you get a 7th-generation 3.1-GHz Intel Core i7-7920HQ processor with 64GB of RAM, two 512GB PCI-e SSDs in Super RAID 4 configuration (and a 1TB, 7,200-rpm hard drive) and a pair of Nvidia GeForce GTX 1080 GPUs in SLI configurations with 8GB of VRAM each. If you’re looking to save a little bit of cash, there’s the $4,199 model, which gets you a pair of Nvidia GeForce GTX 1070 GPUs in SLI configuration.